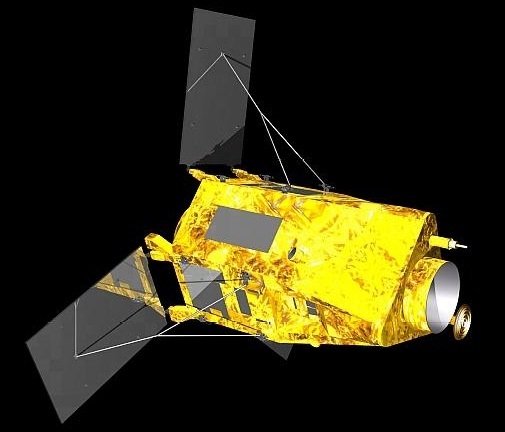 KazEOSat-1 sometimes referred to as DZZ-HR is a high resolution Earth Observation Satellite build by Airbus Defence & Space (Astrium) and French contractor SAS for operation by the National Company Kazakhstan Gharysh Sapary (KGS) on behalf of the Kazakhstan National Space Agency. 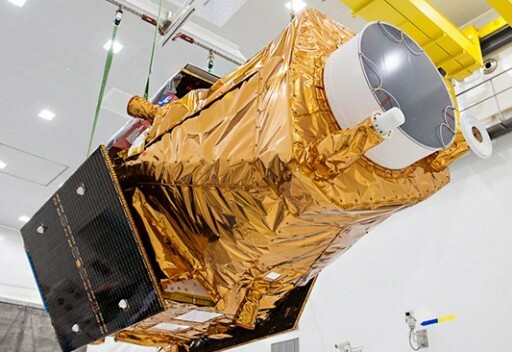 The satellite is part of a two-satellite Earth Observation constellation complemented by the medium-resolution KazEOSat-2 that is set for launch aboard a Dnepr rocket later in 2014. Utilizing the latest Earth observation technologies, the constellation will provide Kazakh policy makers with a resource monitoring & management, land-use mapping and environmental monitoring capability. KazEOSat-2 weighs 830 Kilograms, is 2.1 by 3.7m in size and uses Astrium’s AstroSat-500 satellite platform optimized for low-orbiting remote sensing payloads. The centerpiece of the spacecraft is the NAOMI payload going by the full name of New AstroSat Optical Modular Instrument. NAOMI achieves a ground resolution of up to one meter delivering multispectral images and panchromatic imagery covering the visible spectral band. The AstroSat bus has successfully demonstrated its capabilities as part of several missions including the recent SPOT Earth observation satellites that also carried the NAOMI payload. The AstroSat-500 bus is hexagonal in shape using composite panels and interior panels to provide mounting surfaces for the various satellite systems. The spacecraft is equipped with three deployable solar panels that are fixed in position and feature triple-junction Gallium-Arsenide solar cells. Overall, the solar panels provide a nominal power of 1,200 Watts using a shunt regulation system. 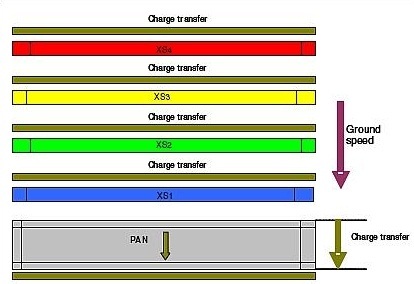 Optionally, a Maximum Power Point Tracker can be used to increase power output for payloads with higher power demand. Electrical power delivered by the arrays is passed to the Power Control and Distribution Unit that provides power regulation and distribution functions, conditioning an unregulated 28-Volt power bus and controlling the state of charge of Li-Ion batteries used for power storage. The KazEOSat-1 spacecraft uses a Hydrazine monopropellant propulsion system featuring a number of low-thrust engines for use in orbit adjustment and maintenance maneuvers and attitude control. Attitude control is provided by four reaction wheels and three magnetic torquers are used for coarse control and for momentum dumps of the reaction wheels. Three-axis attitude and orbit measurement is accomplished through a Star Tracker Assembly with three optical heads and a GPS unit. The star tracker delivers pointing knowledge of up to 30 µrad while the attitude control system provides a pointing accuracy of 500 µrad. An inertial measurement unit is used to improve three-axis rate measurements and serves as backup to the star trackers. The dual-frequency GPS receiver can be used for orbit determination with an accuracy of 3 meters. In spacecraft safe mode, attitude determination is provided by a Magnetometer and Coarse Sun Sensor that are used to keep the satellite in a safe Earth- or Sun-pointed attitude. Payload data is downlinked via a two-channel cold redundant X-Band system that achieves a data rate of up to 270Mbit/s using QPSK modulation. The communication system uses a single isoflux antenna. Telemetry downlink and command uplink is accomplished using an S-Band system with omni-directional coverage. Command & data handling, spacecraft control and communication is provided by a control system built around the SCOC3 Spacecraft Controller On-a-Chip that uses a LEON-3 microprocessor. The redundant onboard computer provides processing, reconfiguration and timing functions, data input/output and customization capabilities. A Remote Interface Unit allows the spacecraft computer to be reconfigured in flight. Two 1553 data buses are used to handle spacecraft platform data and data acquired by the payload. The flight software used by the spacecraft is based on the RTEMS operating system with customizable software elements tailored for specific mission purposes. The flight computer uses an autonomous Failure Detection, Isolation and Recovery system. Data delivered by the satellite payload is stored by a Compression Recording and Ciphering unit, CoReCi. This system uses flash-based technology and a modular approach to provide an incremental data storage capacity up to 10Tbit. CoReCi supports input data rates up to 1.4 Gbit/s and for KazEOSat-1 has a capacity of 850 Gbit. The system uses embedded Wavelet Image Compression, data ciphering using Advanced Encryption Standard, and data formatting according to ESA’s packet-telemetry standard. The system weighs 14 Kilograms and has a peak power consumption of 75 Watts. The heart of the KazEOSat-1 spacecraft is the NAOMI payload – the New AstroSat Optical Modular Instrument. NAOMI has extensive flight heritage having flown on the SPOT-6, SSOT and VNREDSat-1A satellites. The instrument weighs 150 Kilograms and has a peak power demand of 180 Watts. 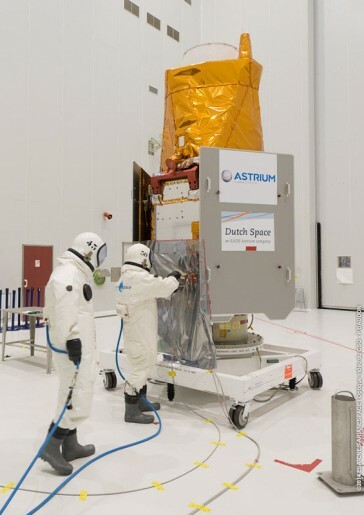 The instrument is a high-resolution pushbroom-type imager that was developed by EADS Astrium and SAS. 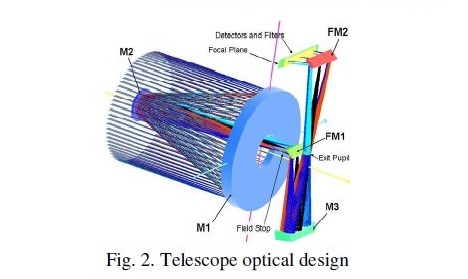 NAOMI consists of an optical bench consisting of SiC to provide extremely high thermal stability, a focal plane assembly with Time Delay Integration Detector, back-end electronics for data processing and interfaces for data and command exchange with the spacecraft computer. The telescope uses a Korsch combination with three aspheric mirrors and two folding mirrors. This design was chosen because of its simplicity and compact size – fitting within the small spacecraft platform. An entrance baffle is used for stray light rejection. Light entering the detector is passed from the 64-centimeter primary mirror M1 onto the M2 mirror before passing Folding Mirror 1 to the M3 mirror that reflects the light through the Exit Pupil to Folding Mirror 2 that passes the light onto the detector. The Time Delay Integration detector uses a silicon CCD detector assembly with 7000 pixels for the panchromatic channel and four lines of 1750 pixels for the multispectral bands. All detectors are equipped with strip filters and front end electronics. The front end electronics provide the detectors with biasing and clocking signals as well as pre-amplification of the signals before transmitting them to the video electronics. The back-end electronics provide power supplies for the operation of the front-end and provide data processing via modular video chains that operate at frequencies of up to 15Msamples/sec. The signals from the front end is digitally converted in the back end and the data is then transferred for real-time processing and storage in the mass memory. The instrument covers five bands – the panchromatic band of 450 to 750 nanometers and four multispectral bands including blue (450-520nm), green (530-600nm), red (620-690nm) and near infrared (760-890nm). The telescope covers a ground swath of 20 Kilometers and the spacecraft has a field of regard of +/-35 degrees (800km) as it is tilted around nadir for event monitoring. Overall, the instrument achieves a ground resolution of up to one meter in panchromatic mode and four meters for multispectral imagery. KazEOSat-1 will operate from a Sun-Synchronous Orbit at an altitude of 750 Kilometers at an inclination of 98.5 degrees with a local time of descending node of 10:30. 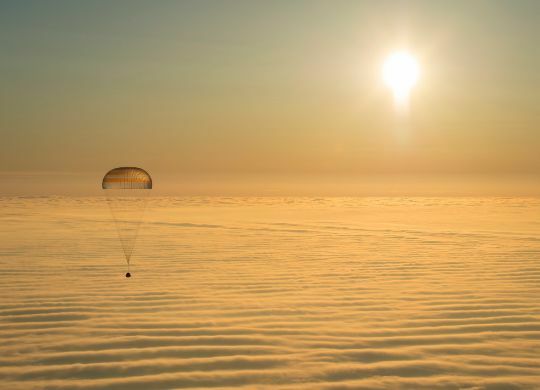 In this orbit, the spacecraft provides a re-visit time of three days for each given location in Kazakhstan. In its nominal mission, the spacecraft is flying in a sun-pointed attitude when the vehicle is not used for imaging. For imaging sessions, KazEOSat-1 turns to a geocentric attitude up to +/-35 degrees off-nadir. The satellite can perform imaging for ten minutes of its orbit covering a strip of 2000 Kilometers. One-pass three-strip area and stereo imaging can be accomplished in one ground pass due to the agility of the satellite.